German Chancellor Angela Merkel met with main opposition leader, CHP President Kemal Kılıçdaroğlu on Feb. 3. Referring to CHP head Kemal Kılıçdaroğlu’s previous remarks to German daily Süddeutsche Zeitung that her visit to Ankara to meet President Recep Tayyip Erdoğan would work in favor of the latter’s upcoming referendum campaign, Merkel said she was pleased to hear the views of the opposition as well, according to sources familiar with the meeting. Kılıçdaroğlu said they expect “European friends to stand with democracy,” to which Merkel responded that she would continue to do so. Sources said they discussed the government’s post-coup attempt crackdown, state of emergency practices, and the constitutional amendment referendum likely in early April. The CHP leader noted that he was concerned about any referendum campaign taking place under the ongoing state of emergency, with widespread censorship of the media and limits to freedom of assembly. 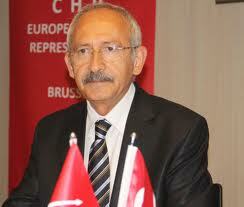 Upon questions from Merkel about whether the CHP would be able to fully express its views during the referendum process, Kılıçdaroğlu referred to the heavy pressure on the media.